Patients who are 12 to 14 months may receive an MMR vaccine by scheduling a Nurse Visit, instead of waiting until the 15 month visit. Patients who are 15 months and older who have not had an MMR vaccine and do not have a well visit within a week, should schedule a nurse visit within ONE week. Patients who are 4 years of age and older, who have not had 2 vaccinations should schedule a nurse visit within ONE week. Please note that Four Seasons Pediatrics has a vaccine policy which requires up to date vaccinations for diseases that can be spread within the practice waiting room. Upon identification and notification about the need for vaccination for Measles or Pertussis (also in the midst of an outbreak), we will require vaccination within 7 days. Failure to comply will result in discharge from the practice. This policy stems from our best intention to protect individual children and children who visit the waiting room whether for a well visit or a sick visit. 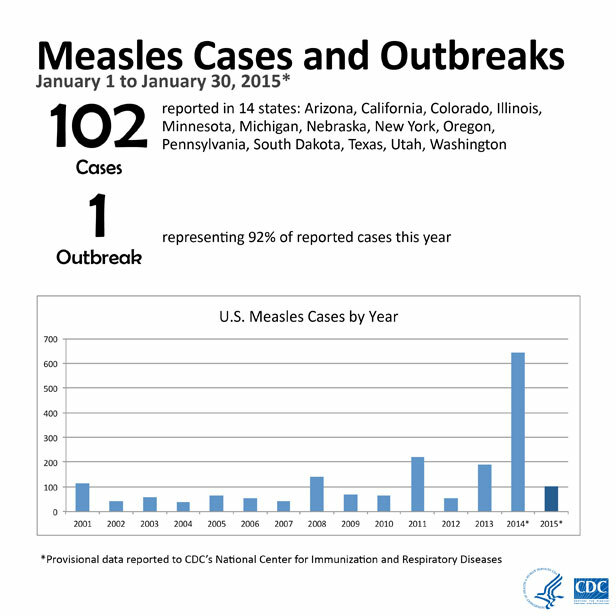 From January 1 to January 30, 2015, 102 people from 14 states were reported to have measles*. Most of these cases are part of a large, ongoing multi-state outbreak linked to an amusement park in California. On January 23, 2015, CDC issued a Health Advisory to notify public health departments and healthcare facilities about this multi-state outbreak. The United States experienced a record number of measles cases during 2014, with 644 cases from 27 states reported to CDC’s National Center for Immunization and Respiratory Diseases (NCIRD). This is the greatest number of cases since measles elimination was documented in the U.S. in 2000. The majority of the people who got measles were unvaccinated. Picture 1: Mouth of a patient with Koplik spots, an early sign of measles infection. Picture 2: Skin of a patient after 3 days of measles infection. Three to five days after symptoms begin, a rash breaks out. It usually begins as flat red spots that appear on the face at the hairline and spread downward to the neck, trunk, arms, legs, and feet. Small raised bumps may also appear on top of the flat red spots. The spots may become joined together as they spread from the head to the rest of the body. When the rash appears, a person’s fever may spike to more than 104° Fahrenheit. Measles is a highly contagious virus that lives in the nose and throat mucus of an infected person. It can spread to others through coughing and sneezing. Also, measles virus can live for up to two hours on a surface or in an airspace where the infected person coughed or sneezed. If other people breathe the contaminated air or touch the infected surface, then touch their eyes, noses, or mouths, they can become infected. Measles is so contagious that if one person has it, 90% of the people close to that person who are not immune will also become infected. Infected people can spread measles to others from four days before to four days after the rash appears. Measles is a disease of humans; measles virus is not spread by any other animal species. • Ear infections occur in about one out of every 10 children with measles and can result in permanent hearing loss. • Diarrhea is reported in less than one out of 10 people with measles. • As many as one out of every 20 children with measles gets pneumonia, the most common cause of death from measles in young children. • About one child out of every 1,000 who get measles will develop encephalitis (swelling of the brain) that can lead to convulsions and can leave the child deaf or mentally retarded. • For every 1,000 children who get measles, one or two will die from it. Measles can be prevented with the MMR (measles, mumps, and rubella) vaccine. In the United States, widespread use of measles vaccine has led to a greater than 99% reduction in measles cases compared with the pre-vaccine era. Since 2000, when measles was declared eliminated from the U.S., the annual number of people reported to have measles ranged from a low of 37 people in 2004 to a high of 644 people in 2014. Most of these originated outside the country or were linked to a case that originated outside the coutntry. Measles is still common in other countries. The virus is highly contagious and can spread rapidly in areas where people are not vaccinated. Worldwide, an estimated 20 million people get measles and 146,000 people die from the disease each year—that equals about 440 deaths every day or about 17 deaths every hour. • Infants 6 through 11 months of age should receive one dose of MMR vaccine. Infants who get one dose of MMR vaccine before their first birthday should get two more doses (one dose at 12 through 15 months of age and another dose at least 28 days later). • Children 12 months of age and older should receive two doses of MMR vaccine, separated by at least 28 days.